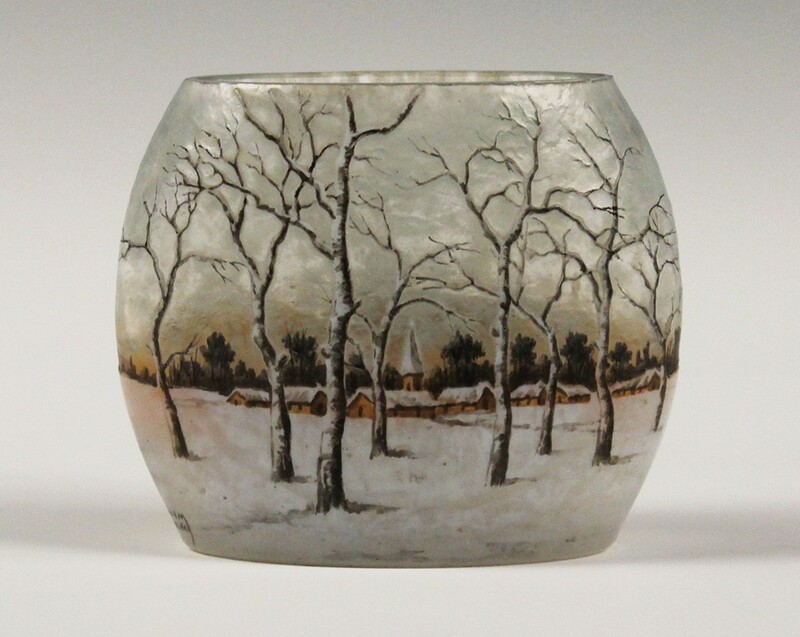 A Daum Nancy enamelled cameo glass winter landscape vase, circa 1905, of oval form, decorated with a continuous snowy scene. These opening lines from the famous song written by Irving Berlin and sung by Bing Crosby speak into a bygone image of Christmas. Here in Sussex we often have to wait until spring is almost breaking through before the last gasp of winter brings snow. But the image of gathering with loved ones that the song conjures in our imaginations remains as precious as it has always been. Perhaps the buyer of this glass winter vase by Daum Nancy (above), from 1905, was dreaming of a white Christmas when they paid £1300 for it at Toovey’s Christmas auction. The acid etched decoration covered all sides of the vase. The landscape would have been painted and acid etched onto the body of the vessel. The three dimensional quality is heightened by the application of enamels; opaque for the snow and polychrome for the village and trees. The decorated vase would have been heated to fuse the enamels to the glass base. The making of each of these individual pieces would have involved numerous craftsmen. Although you sense the cold it’s a welcoming scene and the snow covered treetops really do glisten with the iridescence of the glass. The glasshouse at Nancy in France was run by the Daum family from 1875. Most notably, under Jean-Louis Auguste Daum (1853-1909) and his brother Jean- Antoine Daum (1864-1930), the factory produced Art Nouveau glass using a variety of techniques, some of which are seen here. These pieces are usually marked ‘Daum Nancy’ with the cross of Lorraine. 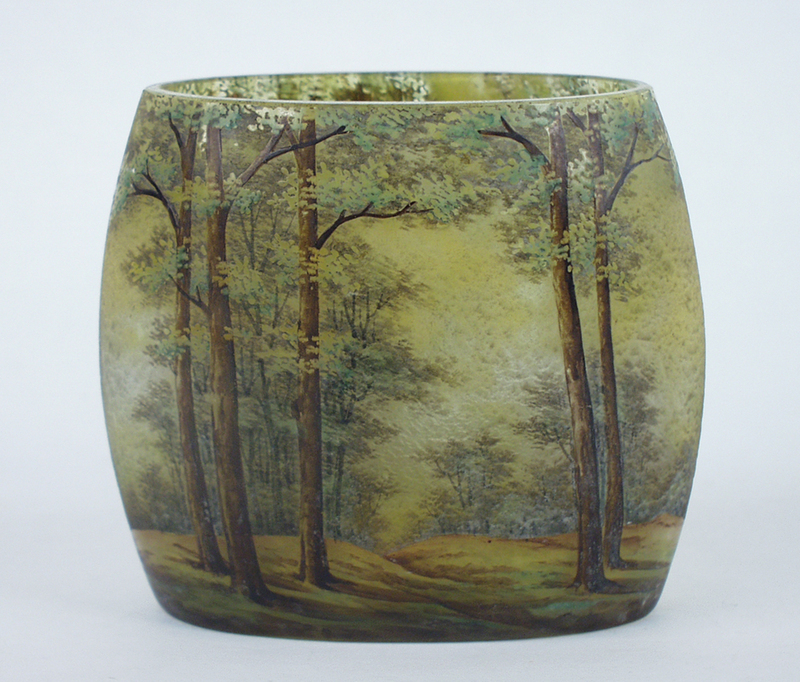 Daum introduced one of the most typical Art Nouveau forms as illustrated by the vase seen here. Vases with these long slender necks were called ‘Berluze’. The shape of this tapering, gently twisting vessel is accentuated by the entwining summer cornflowers which decorate it. It was sold in a Toovey’s specialist auction for £2100. Daum landscape vases were produced to represent all the seasons with different weather and emblems. Another fine example of this is the oval vase decorated with a summer scene depicted under a setting sun. Today this vase would realise in excess of £1500 at auction. As Christmas approaches and our preparations and shopping seem ever more urgent bless yourselves with a moment to reflect that our gifts are valuable because they are expressions of our love for one another. By Revd. Rupert Toovey. Originally published on 16th December 2015 in the West Sussex Gazette.